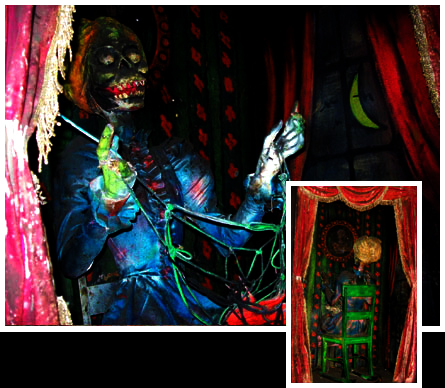 Can't make it to Trimper's to ride The Haunted House this summer? Don't worry. 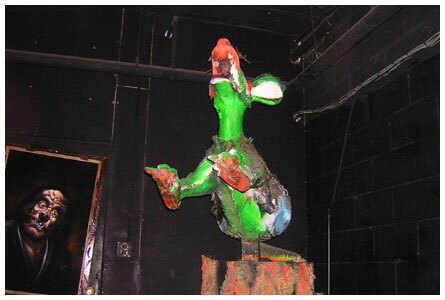 Tour it here and be up-to-date with all of the current effects inside the attraction. All effects are listed in the order they are placed in the ride. Keep an eye out for several new effects this year! Don't forget, you can view a complete track layout and photos of previous stunts in the interior section of the site. Have questions or comments? Be sure to send us an e-mail. We would love to hear from you! 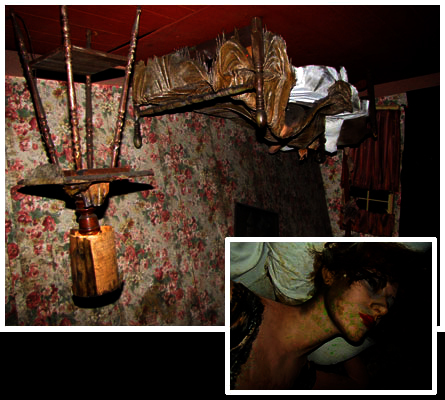 The Attic Rat in the first room has been in the same location for nearly 50 years. It has changed very little during its tenure in the ride, and is considered an icon as it’s the first effect to be seen upon entry into the attraction. Next up on the left are three creepy skull spiders rotating on a decrepit staircase. Make sure you don’t get tangled in their web! 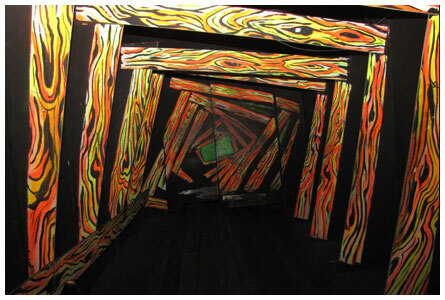 The Tilted Corridor adds a unique optical illusion to the ride. The artwork on these timbers is original to 1964, and the car tilts as it climbs this hill thanks an elevated platform on the left side of the track. The dizzying Revolving Barrel effect turns slowly to make you feel like you are falling into space. 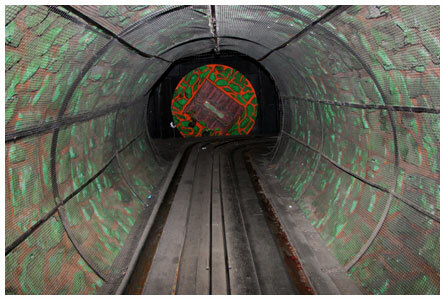 The dummy car on the revolving disc at the end of this tunnel makes you feel like you are not alone in the mayhem! Don't look into the eyes of this creepy girl, a new stunt from the ScareFactory! She swings back and forth every few minutes as she guards the entrance to the Upside-Down Room. Next you will turn right into the Upside-Down Room, original to 1964. This helter-skelter situation reveals a damsel in distress lying in a crooked bed above you surrounded by old bedroom furniture. Hopefully you'll be able to stay right-side up! 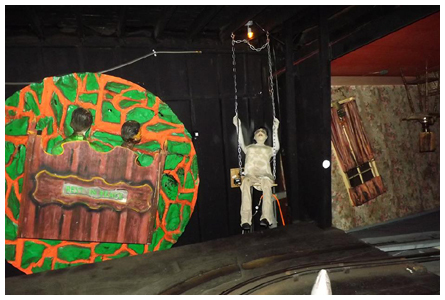 A brand new display comprised of some tombstones and a zombie skeleton awaits you on the left as you exit the Upside-Down Room. A Shivering Mummy can be seen on the right. Straight ahead is one of the ride's most obscure stunts. The Birthday Party includes two clowns congregating over a cake with a severed head adorning the top. Try to blow out the candles as your coffin car flies by! An 11' tall Angel of Death reaches for you as your car quickly passes. One of Bill Tracy's most famous stunts, the Old Mill is original to 1964. A large saw blade cuts a damsel right up the middle before your very eyes. Better escape quickly before you too become a victim of the Old Mill! A gentle, harmless old lady turns 180 degrees in her chair to expose a skeleton knitting a spider web! 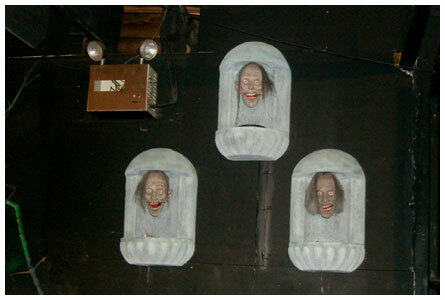 A few creepy heads adorn the wall nearby. Don’t make eye contact! The Reacher springs out of the darkness and tries to grab you as your car proceeds down the hill into the Graveyard. An old skeleton pops up to say hello before entering into the Graveyard. This stunt came from Phantasmagoria.